Each year we recruit approximately 11,000 teaching professionals as markers during the National Qualification exams. The majority of exam scripts are now marked using an online marking system. E-marking maximises efficiency, effectiveness and security, and helps us to ensure quality assurance. 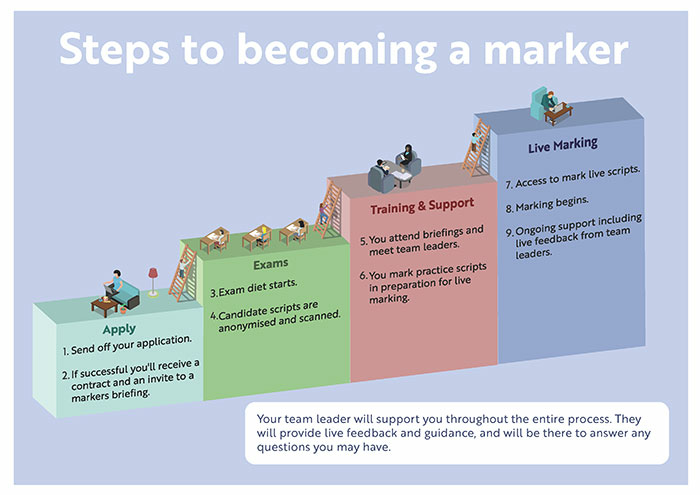 The graphic below shows the key steps to becoming an e-marker. Press Ctrl key and + or - to zoom in or out. How long do I need to be teaching in order to be able to apply to mark? In order to be an SQA marker, you need to have a minimum of two years experience of teaching the subject at the level you wish to mark. Can I apply to mark when someone else in my department already marks? Yes, as long as you are still able to attend the mandatory marker meeting. If you do not attend the markers meeting you will not be permitted to mark for that year. When will I get my invitation to mark for next year? We send invitations to mark from mid-November onwards. Do I have to reapply to mark each year? No, if you successfully achieve the Key Performance Measures (KPMs) set you will automatically be re-invited to mark the following year. We will inform you if you do not achieve the KPMs set. Can I mark more than one component? Yes, many of our markers mark more than one component. We just need to be sure that the marking periods do not overlap. Can I mark more than one level? Yes, many of our markers mark more than one level. We just need to be sure that the marking periods do not overlap. Can I mark more than one subject? Yes, if you are qualified in more than one subject and teach the subjects you wish to mark then this is possible as long as the marking periods do not overlap. How many scripts do I have to mark? This varies from subject to subject and across levels. We calculate the number of scripts you mark based on a script throughput rate. This equates to the time spent marking so that most markers will spend roughly the same amount of time marking for us.